The Hilton Waikoloa is located on the west coast of the Big Island of Hawaii. 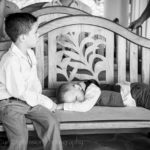 It is huge resort with endless possibilities for photo opportunities and backdrops from tall waterfalls, sand, palms, stair cases, a rope bridge, a chapel, beautiful lawns and more. 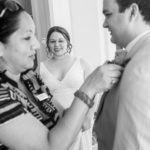 If you are looking for a Hawaii wedding venue with a lot of possibilities this is the place for you. The Hilton even has a boat that travels guests through the resort, an air conditioned tram and a dolphin experience on resort where you can even arrange to touch a dolphin in their dolphin experience. 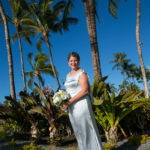 As a wedding photographer on the Big Island of Hawaii I will show of a few of my favorite spots at the resort. The Hilton Waikoloa has a number of different bridges; a rope bridge above the pool, bridges over the ocean, and others throughout the resort. Another fun feature of the Hilton is all the waterfalls. One of the waters is quite large and you can even walk behind it. There are other numerous waterfalls through out the resort as well. There is only one other resort on the island that has a chapel on property. Makes a great combination to be able to get married in a church and then walk outside into all the beauty Hawaii has to offer. Another feature that the Hilton has that not many other resorts do is a grand staircase and other beautiful architecture. A nice blend of Hawaiian beauty and more traditional wedding photography in one location. The Hilton has numerous indoor and outdoor reception sites. 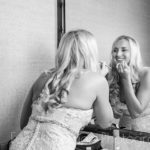 You can have your reception under the stars in front of the lagoon and waterfall or you can have your reception in one of the many indoor ballrooms, from intimate to grand. The palace gardens is a beautiful lawn area overlooking the ocean with the chapel just in the background. Also on property is a beautiful white gazebo just close by from the Palace Garden lawns. A venue for an intimate ceremony or a location for wedding portraits before or after the ceremony. On the far end of the property is a place know as buddha point, which has a giant white buddha statue. It has a beautiful view of the resort and a 180 degree view of the ocean. A fun way to get from your ceremony site to your reception site is on one of the resorts boats. You can have the boat decorated and ready for you and your party as a fun way to cross the resort. There are too many other places to list. The Hilton Waikoloa kinda feels like a Hawaiian Disney Land with so many places to explore.